Precious Pets Paradise has been offering unique pet products since 1996. A family owned business with a main goal of providing quality, superior pet products. Our products will fit all your elegant, stylish, chic and luxurious pet product needs! You have come to the right place for one of a kind gift ideas for your pet or your friends' pets. SNoozer Pool and Patio Rectangle Outdoor Dog Bedis a great place for your dog to relax in the sun after a dip in the lake! 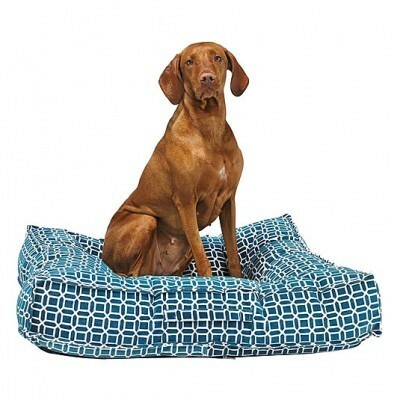 The cover of this outdoor dog bed is constructed from high quality water resistant fabric that allows water and moisture to simply bead up and and run off the dog bed providing your precious pet with a dry comfy spot to relax in the sun. The fabric is of marine quality and promises to be fade resistant! 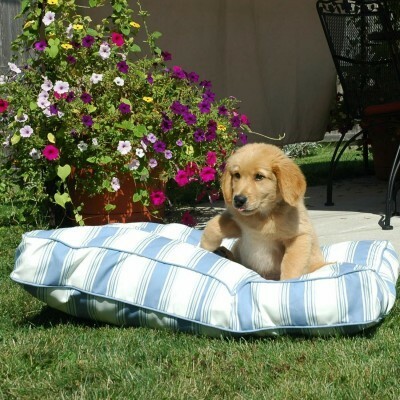 Each SNoozer Pool and Patio Round Outdoor Dog Bed is stylishly accented with a complementary finished piping. 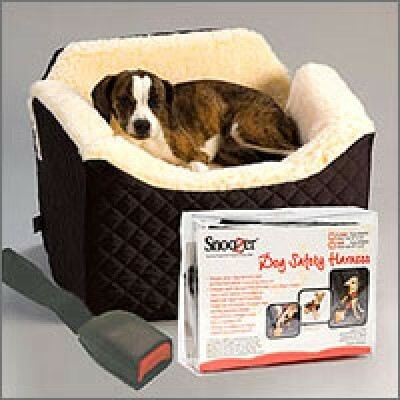 The covers of this SNoozer Dog Bed are removable for machine washing and feature a removable inner liner! The liner is filled with SNoozer's poly/cedar fill loft!O'Donnell Industries has been producing fine pet products since 1985. From SNoozer Beds, to LookOut Car Seats, to lambskin pet beds, to waterproof and ortho loungers. They produce a product with excellent quality...one that your pet will enjoy for years! The Snoozer Pet Car Safety System, is the only pet car seat that is crash tested to the same standards as a child safety system, 30 lbs at 30 miles per hour! How is that for peace of mind when traveling with your fur-baby! This Snoozer Pet Car Safety System features three great products grouped together for maximum protection for your precious pet. Each Safety System includes: Snoozer Lookout Harness (Small 12-16 in girth or Medium 15 in - 20 in girth), Snoozer Lookout 1 Pet Car Seat and 1 Pet Seatbelt Adapter. The Snoozer Lookout 1 Pet Car Seat has a black quilted nylon and sherpa interior, the seat belt secures the system to your vehicles seat. The crash tested safety harness and seatbelt adapter secure your precious pet to the seat-belt. Backed by manufacturer's one year limited warranty. The Bowsers Diamond Piazza Dog Bed is the newest addition to the Bowsers' family! 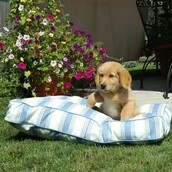 Comfort squared, the Piazza Dog Bed allows you to show off your dog in public life! You precious pets will be drawn to the tufted square, fibre topped foam center cushion on this overstuffed dog bed! You will love the sleek, space saving modern design of the Bowser Diamond Piazza Dog Bed. The cover has a convenience carry handle and is removable for machine washing and drying. The Big Shrimpy Versa™ Blanket allows you to protect your car's back seat. 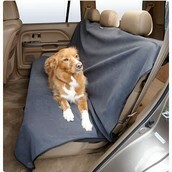 This dog blanket can be used while picnicing, to create a makeshift shelter, or even keep your pet warm and cozy. This dog blanket features soft fleece which is bonded to water resistant polyester with nylon webbing loops, detachable buckled straps and an eight-foot length of elastic cord. The Big Shrimpy Versa™ Blanket is not only comfort but it is compact and quite utilitarian! This dog blanket is easily washed and dried to keep it clean and ready for all that your day has in store. It will protect your car from wet grass, wet dogs and all that comes with them, thanks to the water-resistant polyester backing. The PetZip Cute Pet Buggy Pet Stroller has a light weight frame with a lovely polka dot pattern for the canopy. The front wheel of this pet stroller has a 360 degree turn radius of easy maneuvering. Rear brakes keep this dog stroller still while taking a break. An interior leash is included in insure that your pet stays securely fastened for safe travel. 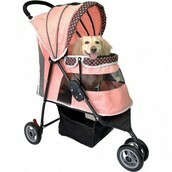 This pet stroller has a water repellent and anti grasp inner cushion. It will easily fold and stores flat when not in use. Precious Pets Paradise is a division of Zicom Inc. and is based in South Florida. We are committed to providing our customers with exceptional pet products! We take great pride in the opportunity to offer you the best the pet industry has to offer your furry family members! Please feel free to contact us with any questions you may have about our products and service. We hold true to our values of unmatched customer service, knowledgeable staff and unsurpassed desire to bring to you the finest pet products available. Please note charges to your credit card will reflect as Zicom Inc. on your credit card statement.